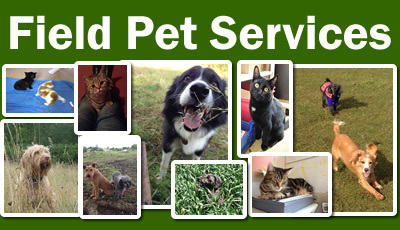 Professional, reliable and flexible pet care from Field Pet Services serving the Stroud area including The Stanleys, Stonehouse, Eastington, Rodborough and Standish. Welcome to Field Pet Services! A company providing professional, reliable and flexible pet care. We can provide Dog Boarding, Dog Walking, Cat Feeding and Small Animal Feeding in the Stroud area. Areas covered include The Stanleys, Stonehouse, Eastington, Rodborough and Standish. We are fully insured. Please browse our site for prices and details of the services we provide. Have a look at our Gallery to see all our happy clients (animal variety!) and check out our Testimonials for comments from our satisfied clients (human variety! ).